Hey everyone. Welcome to this week’s Food Network #FallFest, celebrating carrots! There are so many ways you can make carrots beyond just steaming and serving them. A favorite Thanksgiving side dish in my family is my carrots with maple syrup and dill – so good! 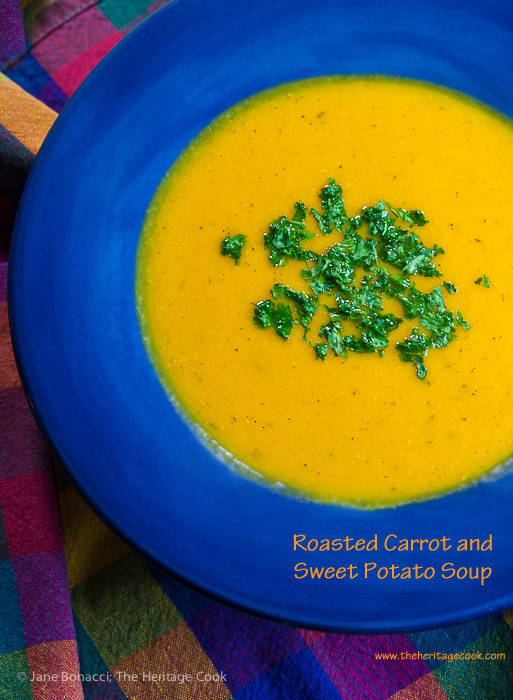 Today I created a creamy, luscious soup made with carrots and sweet potatoes. Healthy and delicious! This soup is perfect for fall and winter, and with the arctic blasts that are burying much of the nation in snow and temperatures that dropped up to 40 degrees overnight, this will definitely help warm up chilly toes and nippy noses! Roasting the vegetables deepens the flavors and brings out the natural sugars. The carrots, sweet potatoes, and onions all have a lot of natural sweetness and complemented one another. It took only a little seasoning to balance all the flavors and give us one of the best soups I’ve ever made. And the fact that it was healthy and packed with nutrients was a bonus. I chose to make the carrot-sweet potato soup because I wanted to use a new toy, the Europro Ninja Professional Blending System with Auto-IQ Technology. This unit is three machines in one – a blender, smoothie maker (nutrient & vitamin extractor), and food processor. If you are looking for something that can make your life a lot easier in the kitchen, take a look at this new system. From solid to full puree in 1 minute – amazing! I have used blenders and food processors for years, so I knew what I wanted to see. I added the roasted vegetables straight into the blending pitcher and it was big enough to take them all in one batch. Without adding any liquid, normally required for pureeing, the Ninja pulverized the vegetables with no trouble, the multiple blades efficiently processing and moving the foods through the pitcher. To get it a little smoother, I added 1 cup of the liquid and hit the puree button again. One minute later and it was the perfect consistency. As we sat down to dinner, The Artist asked what was in the soup, I answered, “If you’re asking if there is cream in there, there isn’t”. He was very surprised and pleased. The blender was so efficient that the vegetables disappeared into a perfect puree. When stirred back into the remaining stock, we had an unbelievably smooth and creamy soup. It is so easy to make a vegetarian/vegan/dairy-free soup that tastes like it has cream in it – and everyone will enjoy it! One thing that I really love about the Ninja is that you can set it up, hit the button and walk away. The system is smart enough to run and then turn off when it is done. I was able to work on something cooking on the stove without having to worry about or monitor the blender. That is a huge help when you have a busy meal in process. If you want the same system I have, Ninja has a special offer now that saves you over $185 by purchasing it through their website. Click here for the offer. Make sure you add the optional food processor bowl for full functionality. If you have a bunch of friends and family visiting over Thanksgiving and during the holidays, make a big pot of this soup and they can get themselves a snack whenever they are hungry. This frees you up to enjoy spending time with them and not spending all your time being a short-order cook. Make sure you check out all the amazing recipes from the other bloggers in the Food Network #FallFest that are listed below the recipe. If you love sweet potatoes, you can add more of them than carrots. If you like spicy food, add chile flakes or chopped jalapeno peppers. If you want this to be vegan, use vegetable stock or water. You have complete control over what your soup will taste like. Use gluten-free stock or make your own. Make sure the thyme and ginger are gluten-free. In a roasting pan or baking sheet with sides, place the chopped carrots. Drizzle with half the oil and sprinkle with salt and pepper; toss to coat evenly with the oil. Put the pan in the oven and roast, stirring occasionally, about 15 minutes. Remove the pan from the oven, add the remaining oil, sweet potato cubes, onions, and celery, sprinkle with a little more salt, pepper and half the thyme. Stir to mix and coat vegetables evenly with the oil. Return to the oven and continue roasting until the vegetables are fork tender, stirring occasionally, about 30 to 45 minutes longer. While the vegetables are roasting, heat the stock or water over medium-low heat in a large soup pot or Dutch oven. Transfer the roasted vegetables and oil to a food processor or blender and puree until smooth. Add 1 cup of the stock if needed to get the vegetables completely smooth. Do this in batches if you have a small blender or processor - do not fill your container more than 2/3 full. Pulse until completely smooth, scraping the sides to get all the ingredients into the blades. Pour the puree into the stock and bring to a boil, stirring regularly. Whisk in the remaining thyme and the salt and pepper. Reduce heat to low and simmer until slightly thickened, about 15 minutes. Taste and adjust seasonings. Serve hot. Can be made up to several days in advance. Store in an airtight container in the refrigerator and reheat before serving. This recipe is part of Food Network’s weekly Fall Fest. See the links below for inspiration and great recipes plus check out our Pinterest page for even more! Disclaimer: I received a blending system from Ninja for review. I did not receive any other compensation. As always, my opinions are my own. This recipe sounds fantastic! I have a question re: ginger in recipe. At the end of the recipe, you write: Whisk in the remaining thyme and the ginger. There is no mention of ginger in the ingredients list. Can you tell us how much ginger to add and what kind (powder, pieces)? Thanks! Thank you for bringing this to my attention. I often use ginger in my carrots soups, but not in this one. I have corrected the recipe. But if anyone wants to add ginger, try 1 tsp ground ginger then adjust to your taste. Enjoy!